Participate in Skype for Business meetings, even if you don’t have a Skype for Business account. 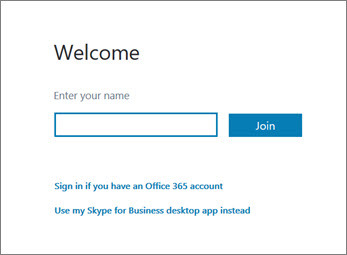 Use this guide to support you during your first meeting using Skype Meetings App or Skype for Business Web App communications software. At meeting time, open your Skype for Business email invitation, and then click Join online meeting in the email message. If this is the first time you are joining a meeting, your browser might ask you to download Skype Meetings App. Click Join with the Skype Meetings App (web). In the Skype Meetings AppWelcome screen that opens, type your name in the Enter your name text box, and then click Join. The participant list indicates the permissions level of each participant: either Presenter or Guest. Only presenters can share their screens, give PowerPoint presentations, open whiteboards, and access other features, depending on how the meeting was organized. The icons next to each name indicate whether the person is currently participating in instant messaging (IM), audio, video, or content sharing in the meeting. At the bottom of the IM window, click the message input area, and begin typing. Tip: You can format your message using the text formatting options, and add emoticons if you’d like to. Note: Your IMs are received by all the meeting participants. Click Share, and then click Attachments(x). Under the attachment you want to save, click Save As. Click Save to choose where you want to save the attachment on your computer. Click Browse to choose a file. After the file uploads, click Attachment in the Share window to save, change permissions, rename, or remove the attachment. Meeting participants will be alerted that there’s a new attachment, which they can save for future viewing. Depending on the permission levels set by the meeting organizer, a meeting presenter will need to make you a presenter (if you are not already one) before you can show your screen or program to the other meeting participants. Note: Only one person at a time can share. In the meeting window, click the Share button to see your sharing options. In the meeting window, click the Share button, and then click Share Screen. If you have only one monitor, it will be displayed to all the meeting participants. If you have more than one monitor, you will be prompted to select the monitor or monitors that you want to display. In the meeting window, click the Share button, and then click Share Program. In the Share one or more Programs dialog box, select the program or programs that you want to display, and then click Share. In the meeting window, click the Share button, click Present PowerPoint File, and then click Browse to choose the PowerPoint file. Use the navigation arrows to advance through your presentation, or click the Show Thumbnails button and click the slide you want to present if you want to present your slides in a different order. The whiteboard is a fresh page for notes and drawings that everyone in the meeting can use together. You must be a presenter to open a whiteboard. In a meeting window, click the Share button, click More..., and then click Whiteboard. To start writing or drawing on the whiteboard, use the tools in the toolbar. Take a quick vote on the current discussion, or gather pertinent information from meeting participants with a minimum of disruption. You must be a presenter to create a poll. In the meeting window, click the Share button, click More..., and then click Poll. 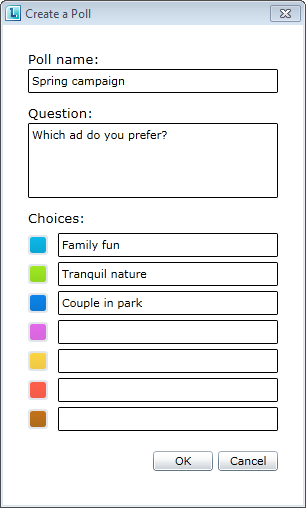 Type your question and at least two possible answers, and then click Create a Poll. If no one else is sharing, your poll opens, and meeting attendees can begin voting. To change the poll, click the Edit poll question and choices button. To allow the meeting Attendees as well as the other Presenters to watch the results of an ongoing poll, click the Show results to everyone button. At meeting time, open your Online Meeting email invitation, and then click Join online meeting in the email message. In the Skype for Business Web AppWelcome screen that opens, type your name in the Join as a guest text box, and then click Join Meeting. Click OK in the Join meeting message box to enter the meeting. At the top of the meeting window, click Phone. To call into the meeting from your phone, call the dial-in number and enter the Participant code when prompted. The participant list indicates the permissions level of each participant: either Presenter or Attendee. Only presenters can share their screens, give PowerPoint presentations, open whiteboards, and access other features, depending on how the meeting was organized. At the top of the meeting window, click IM. At the bottom of the meeting window, click the message input area, and begin typing. At the top of the meeting window, click the Add or view attachments button. Click the file, select a location, and then click Save. At the bottom of the Attachments dialog box, click Add Attachment. Locate and then double-click the file that you want to distribute. When the file appears in the Attachments dialog box, click Close. The first time that you initiate desktop or program sharing, you may be prompted to download the Skype for Business Web App plug-in. Depending on the permission levels set by the meeting organizer, a meeting presenter will need to make you a presenter (if you are not already one) before you can show your desktop or program to the other meeting participants. In the meeting window, click the Share menu to see your sharing options. 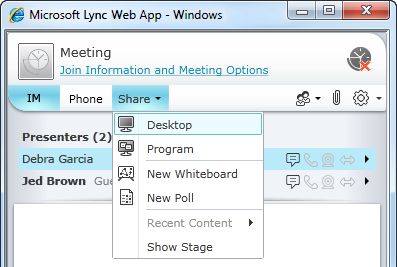 In the meeting window, click the Share menu, and then click Desktop. In the meeting window, click the Share menu, and then click Program. In the Share programs dialog box, select the program or programs that you want to display, and then click Share. In the meeting window, click the Share menu, click PowerPoint Presentation, and then click the PowerPoint file. Use the navigation arrows in the lower right of the stage to advance through your presentation, or click the Show Thumbnails button and click the slide you want to present, if you want to present your slides in a different order. In a meeting window, click the Share menu, and then click New Whiteboard. To start writing or drawing on the whiteboard, use the tools in the lower left of the whiteboard. 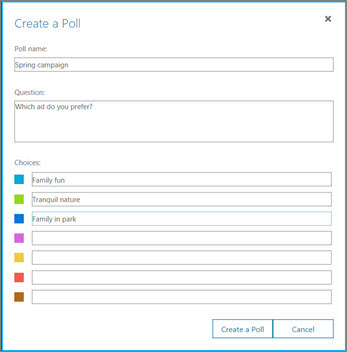 In the meeting window, click the Share menu, and then click New Poll. Type your question and at least two possible answers, and then click OK.
To change the poll, click the Edit poll question and choices button at the bottom of the Poll stage/meeting window.